No one with diabetes should die because they can’t afford their insulin. It’s a medicine that can be produced for just a few dollars… but manufacturers Eli Lilly, Sanofi, and Novo Nordisk mark up the price as much as 5,000 percent and there are seven million Americans with diabetes that have no choice but to pay. The price is so high that people are doing desperate things to get by, like using expired insulin, relying on crowdfunding to pay their bills, or taking less insulin than they need in an effort to ration their supplies. Rationing is extremely dangerous and can lead to a deadly condition known as diabetic ketoacidosis. Three people died in 2017 while rationing their insulin. Three more died in 2018. The Right Care Alliance has been putting pressure on insulin manufacturers, demanding that they lower their insulin prices by 90% to an affordable level. Read all about our recent actions! 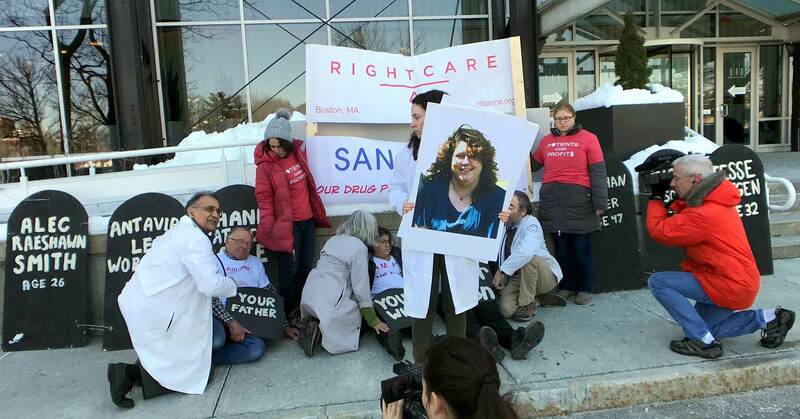 Gravestone delivery to Sanofi, March 2019 — A small group of patients, clinicians, activists, and people with with type 1 diabetes gathered at Sanofi pharmaceuticals to hold insulin manufacturers accountable for recent insulin rationing deaths. Activists brought wooden gravestones with the names and ages of six adults who died from insulin rationing. These gravestones became the backdrop for Right Care Alliance members with type 1 diabetes to tell their personal stories while honoring those who died because they could not afford the insulin they needed. 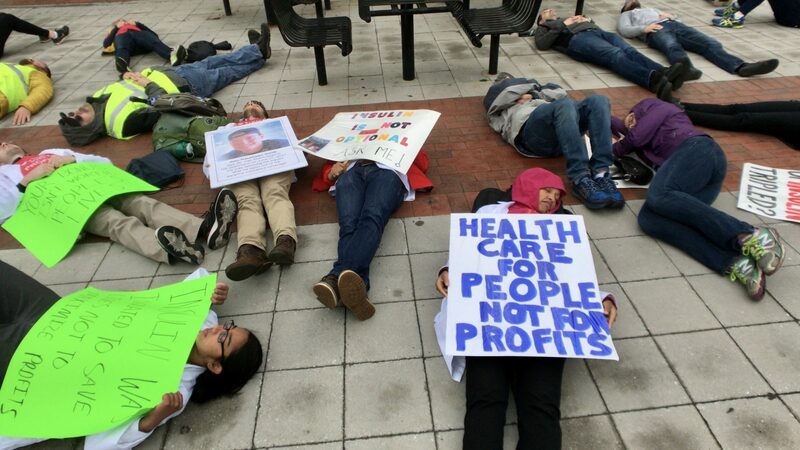 Ashes of the dead delivery to Sanofi, November 2018 — On November 16, 85+ patients, clinicians, students, and activists came to support the fight for lower insulin prices, along with more than five media crews to document the action. 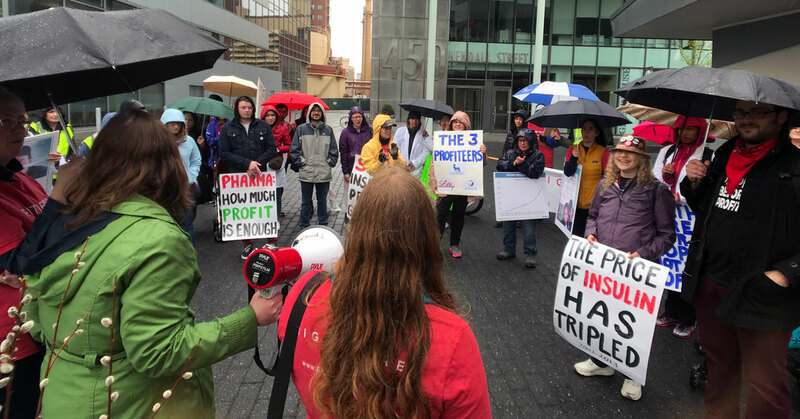 We marched and chanted to Sanofi headquarters, with the help of an activist marching band. 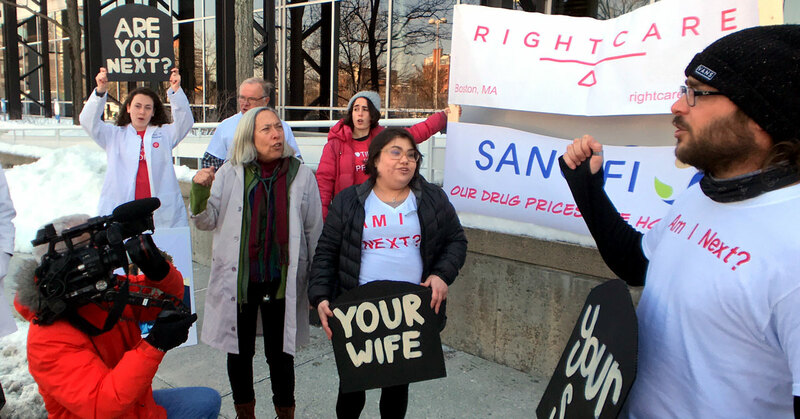 Nicole Smith-Holt, James Holt Jr., and Antroinette Worsham, whose children died while rationing insulin, were at the head of the rally, hoping to send a message to the leadership of the Sanofi drug corporation by delivering the ashes of their loved ones. Mother’s Day protest, May 2018 — For Mother’s Day 2018, we held rallies in Cambridge, Minneapolis, and Cincinatti with a total of more than 100 patients, clinicians, and activists in attendance. We also created virtual Mother’s Day cards with statements from the mothers of young adults who died from insulin rationing, calling on drug companies to lower the price of insulin. The cards gathered over 4,000 signatures online! We then printed 5-foot-high versions of the cards and delivered them to Sanofi pharmaceticals. Meaghan Carter, age 47 (December 25, 2018) — Meaghan Carter had type 1 diabetes for 18 years. When she lost her job and insurance, she struggled to afford her insulin which cost more than $800 a month. She resorted to buying NPH insulin (intermediate-acting insulin) from Walmart, which is cheaper but much more unpredictable than the insulin she normally used. On Christmas Day, 2018, Meaghan died of diabetic ketoacidosis, one day before she would have received a paycheck that could have saved her life. Micah Fischer, age 26 (November 4, 2018) — Micah aged off his father’s insurance plan in June of 2018. His new insurance did not cover Humalog, the insulin that worked best for him and was recommended by his doctor. It would cost $1,200 out-of-pocket. Micah rationed his insulin and go without eating so that less insulin was needed. He was excited to start a new job in October with an insurance plan that covered the insulin he needed, but the plan had a one month waiting period. He only had two and a half weeks to go until his new insurance kicked in when he died. Jesse Lutgen, age 32 (February 7, 2018) — Jesse was diagnosed with type 1 diabetes when he was 12. Jesse had no problems with his diabetes as a child, but as an adult, the high cost of insulin and supplies became his largest financial problem. When Jesse lost his job in November 2017, it became even harder to manage his diabetes. He had made too much money that year to qualify for Medicaid, and the cheapest insurance available had a $10,000 deductible. He decided to pay out of pocket for insulin, but resorted to rationing because the out-of-pocket cost was so high. Alec Raeshawn Smith, age 26 (June 27, 2017) — Alec Smith was diagnosed with type 1 diabetes at age 23. When he turned 26 he was no longer able to be covered under his parents’ health insurance. Alec made too much money to qualify for Medicaid, but his job did not provide insurance. The cheapest insurance plan had a $7,500 deductible, so he decided to go uninsured. He was paying $1,300 a month for insulin and supplies, almost half of his salary. He died on June 27, 2017 from diabetic ketoacidosis, less than one month after going off of his mother’s insurance. Antavia Lee Worsham, age 22 (April 26, 2017) — Antavia struggled to afford insulin when she turned 18 and was no longer eligible for insurance coverage through the state. She had resorted to borrowing insulin from others, changing her diet, and rationing insulin because she couldn’t afford it. Her insulin and supplies cost $1,000 a month. Her brother found her dead from diabetic ketoacidosis on April 26, 2017. Shane Patrick Boyle, age 48 (March 18, 2017) — As a comic book writer, Shane had struggled to afford insulin, but received help from friends and his community in Houston. 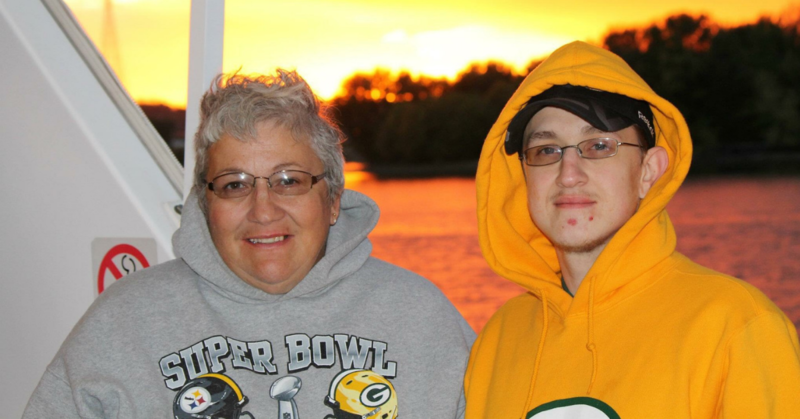 When he went to visit his dying mother in Arkansas, he had no way of buying insulin. In February 2017, Shane Patrick Boyle started a GoFundMe campaign to raise money for a month of insulin. He was $50 short of the amount he needed and died from diabetic ketoacidosis on March 18, 2017, a few days after his mother died. Help us train 500 drug price activists. MOTHER’S DAY 2018 – Our five-foot tall Mother’s Day cards asked that no more sons or daughters die because they can’t afford their insulin. We got 5,000 people to sign them and made a delivery to the offices of an insulin manufacturer. We’re planning direct actions against Big Pharma. Will you join us? Media inquiries should be directed to aaron@rightcarealliance.org.